Two women, one of whom is an American citizen, were Thursday sentenced to death for the 2012 murder of a man who is also an American and the husband of one of the now convicted killers. 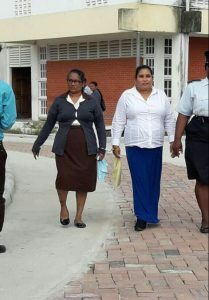 Berbice High Court Judge, Sandil Kissoon handed down the decision after receiving probation reports. They are United States citizen, 43-year old Hemwattie Abdulla, also known as Anita Nazeema Khan, formerly of Albion, Corentyne and Ozone Park, New York and her accomplice, 49-year old Surojinie Permaul also known as Surojnie and Usha of Belvedere New Housing Scheme, Corentyne Berbice. They were found guilty of the murder of Abdulla’s husband Abdool Shakeel Majid called “Shakiel” who was an American citizen. The prosecution’s case was that between April 23 and 27, 2012 in Berbice, Permaul paid Pooran Jhadoo at Abdulla’s request to murder Majid. Jhadoo, a longtime friend of Abdulla, accepted a total of $US 5,000 after being contacted by Abdulla who he claimed was skeptical of committing the crime in the US. The case against Abdulla was that she arranged the murder of her husband for an undisclosed sum of money which he received subsequently following an accident in the US. She invited her pal Permaul to assist her in executing a sequence of events that would lead to the death of her husband. Back in April of 2012, Abdulla and Majid arrived in Guyana on a vacation. However, it was not until five days later that the badly beaten body of the deceased was found on the popular No. 63 Beach on the Corentyne. Before that discovery was made Abdulla had returned to the US and informed relatives that her husband had decided to sojourn to Suriname for while she was sent home to take care of their daughter who was sick. Relatives,however, discovered the suitcase with travelling documents of the man in a house and thus a sparked for further investigations was mobilized.